Secondary Inscription: Inscribed verso, in graphite, "Guercino L.4" and "20". Guercino drew caricatures for his own amusement and that of his friends. He filtered his acute observations of the people and events of everyday life through his sharp perception of the comic, a precedent established by his Bolognese predecessors the Carracci, and before them, Leonardo Da Vinci. 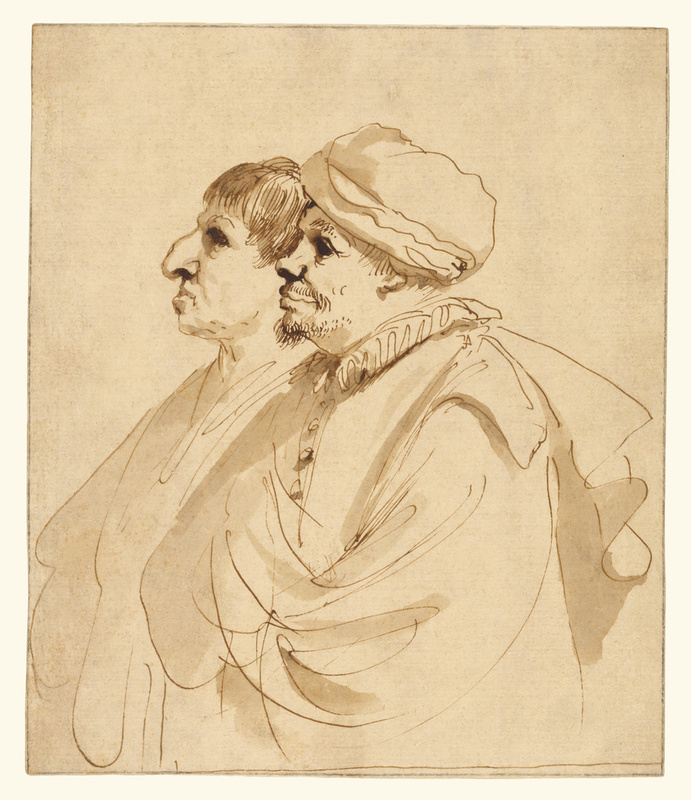 Working quickly, Guercino caricatured two middle-aged men gazing intently to the left. He depicted their faces in the most detail, yet even here he used only a few, well-placed lines to suggest a jawline or a beard. He then delicately touched essential areas with luminous wash in varied intensities. In particular, the face of the man at far left shows Guercino's subtle accuracy with wash, suggesting the effects of sunlight on his skin. The men's clothing is treated even more subtly: a hasty criss-cross of tangled lines describe the arms of the man at the left, folded in his baggy sleeves.